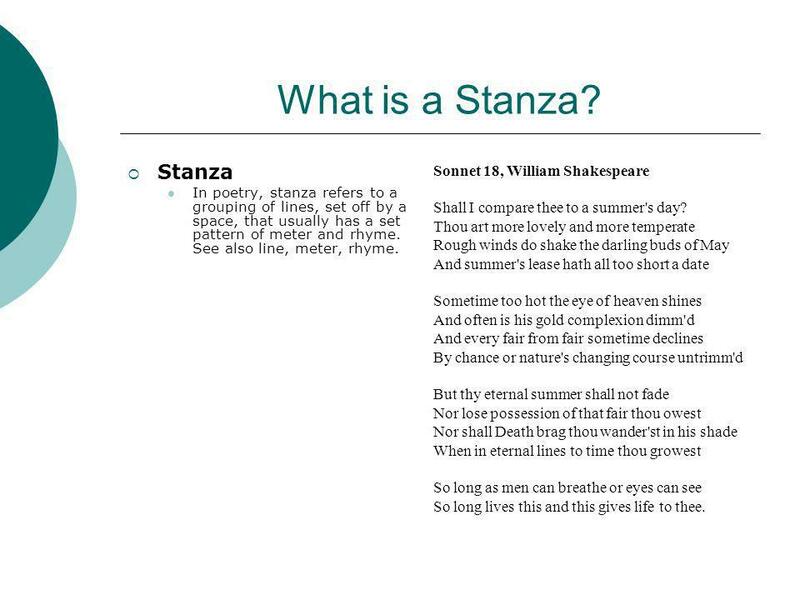 In poetry, stanza refers to a grouping of lines, set off by a space, that usually has a set pattern of meter and rhyme. See also line, meter, rhyme. Sonnet 18, William Shakespeare Shall I compare thee to a summer's day? Thou art more lovely and more temperate Rough winds do shake the darling buds of May And summer's lease hath all too short a date Sometime too hot the eye of heaven shines And often is his gold complexion dimm'd And every fair from fair sometime declines By chance or nature's changing course untrimm'd But thy eternal summer shall not fade Nor lose possession of that fair thou owest Nor shall Death brag thou wander'st in his shade When in eternal lines to time thou growest So long as men can breathe or eyes can see So long lives this and this gives life to thee. 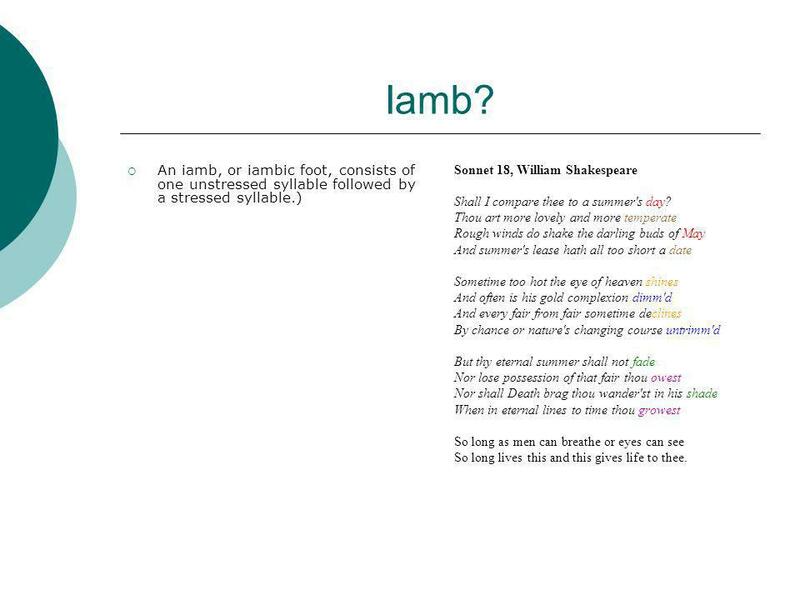 abab/cdcd/efef/gg Sonnet 18, William Shakespeare Shall I compare thee to a summer's day? Thou art more lovely and more temperate Rough winds do shake the darling buds of May And summer's lease hath all too short a date Sometime too hot the eye of heaven shines And often is his gold complexion dimm'd And every fair from fair sometime declines By chance or nature's changing course untrimm'd But thy eternal summer shall not fade Nor lose possession of that fair thou owest Nor shall Death brag thou wander'st in his shade When in eternal lines to time thou growest So long as men can breathe or eyes can see So long lives this and this gives life to thee. A Sonnet has 3 quatrains A four-line stanza Sonnet 18, William Shakespeare Shall I compare thee to a summer's day? Thou art more lovely and more temperate Rough winds do shake the darling buds of May And summer's lease hath all too short a date Sometime too hot the eye of heaven shines And often is his gold complexion dimm'd And every fair from fair sometime declines By chance or nature's changing course untrimm'd But thy eternal summer shall not fade Nor lose possession of that fair thou owest Nor shall Death brag thou wander'st in his shade When in eternal lines to time thou growest So long as men can breathe or eyes can see So long lives this and this gives life to thee. Two consecutive lines of poetry that usually rhyme and have the same meter. 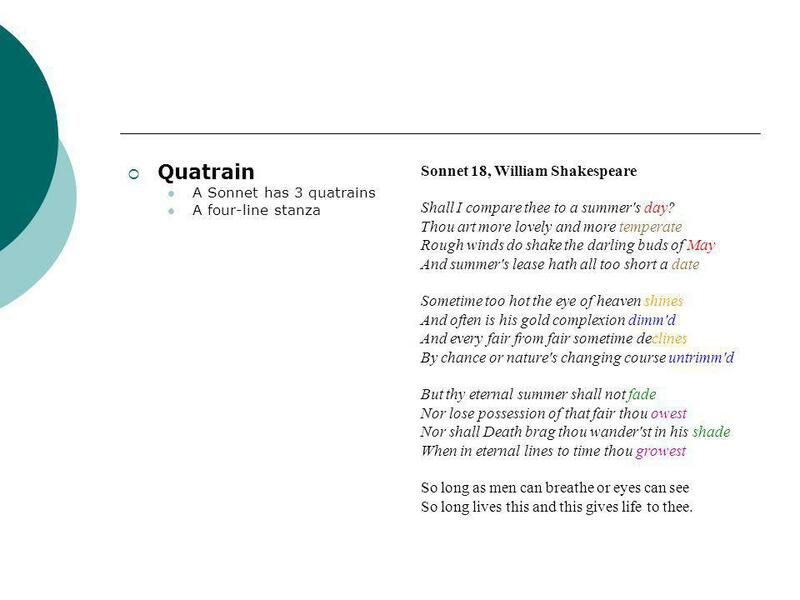 Sonnet 18, William Shakespeare Shall I compare thee to a summer's day? Thou art more lovely and more temperate Rough winds do shake the darling buds of May And summer's lease hath all too short a date Sometime too hot the eye of heaven shines And often is his gold complexion dimm'd And every fair from fair sometime declines By chance or nature's changing course untrimm'd But thy eternal summer shall not fade Nor lose possession of that fair thou owest Nor shall Death brag thou wander'st in his shade When in eternal lines to time thou growest So long as men can breathe or eyes can see So long lives this and this gives life to thee. 6 Syllables? 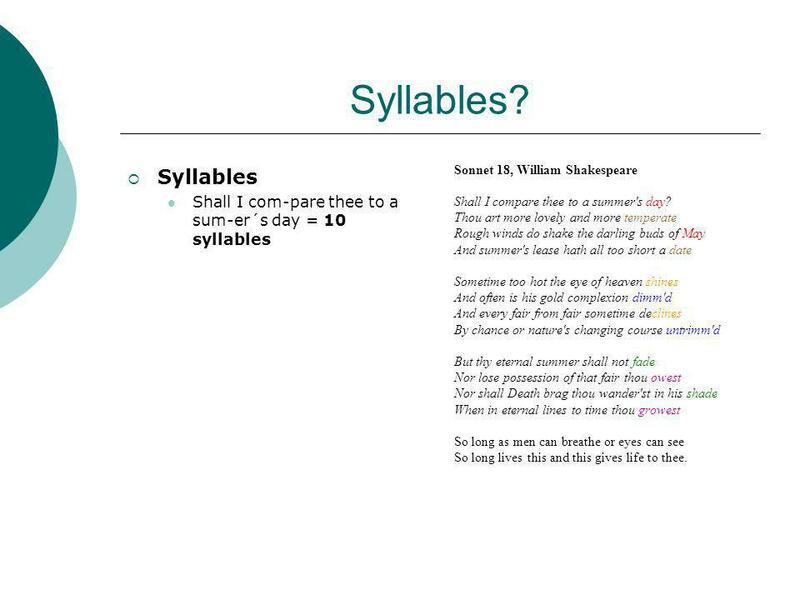 Syllables Shall I com-pare thee to a sum-er´s day = 10 syllables Sonnet 18, William Shakespeare Shall I compare thee to a summer's day? Thou art more lovely and more temperate Rough winds do shake the darling buds of May And summer's lease hath all too short a date Sometime too hot the eye of heaven shines And often is his gold complexion dimm'd And every fair from fair sometime declines By chance or nature's changing course untrimm'd But thy eternal summer shall not fade Nor lose possession of that fair thou owest Nor shall Death brag thou wander'st in his shade When in eternal lines to time thou growest So long as men can breathe or eyes can see So long lives this and this gives life to thee. The metrical unit by which a line of poetry is measured. A foot usually consists of one stressed and one or two unstressed syllables. 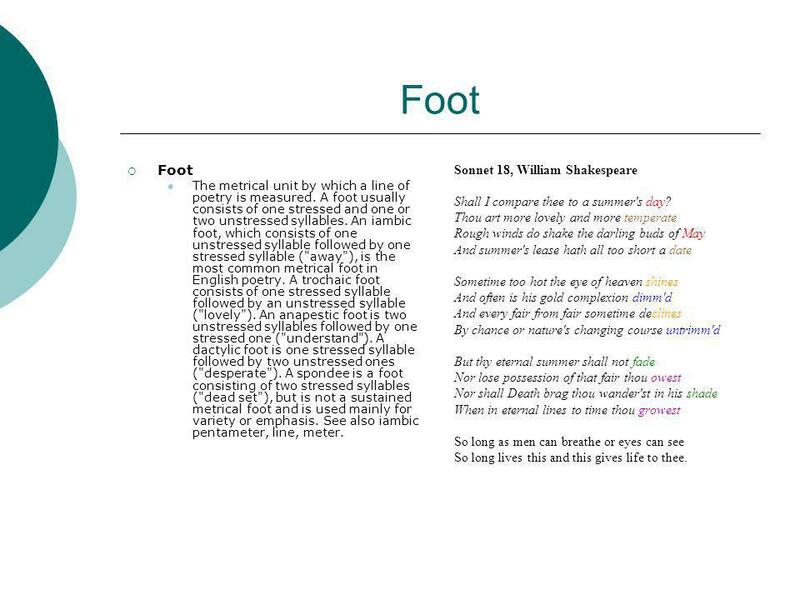 An iambic foot, which consists of one unstressed syllable followed by one stressed syllable ("away"), is the most common metrical foot in English poetry. A trochaic foot consists of one stressed syllable followed by an unstressed syllable ("lovely"). An anapestic foot is two unstressed syllables followed by one stressed one ("understand"). A dactylic foot is one stressed syllable followed by two unstressed ones ("desperate"). A spondee is a foot consisting of two stressed syllables ("dead set"), but is not a sustained metrical foot and is used mainly for variety or emphasis. 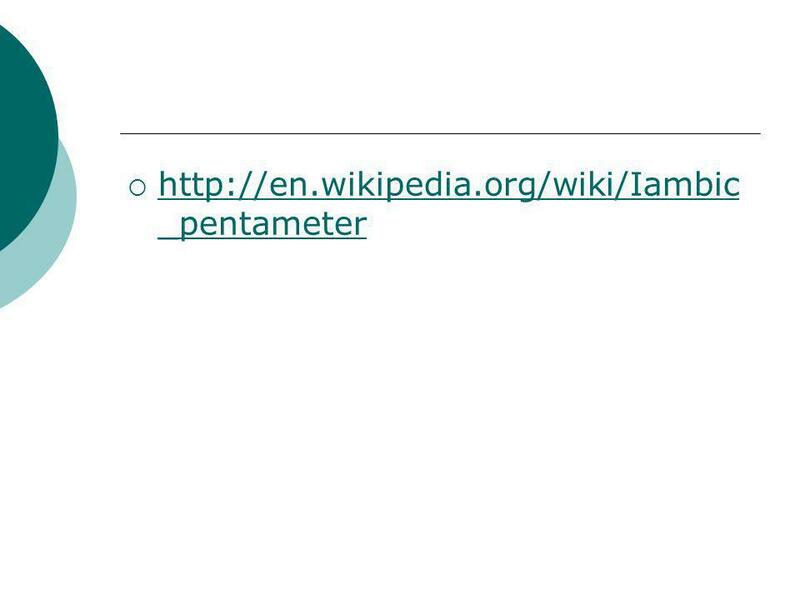 See also iambic pentameter, line, meter. Sonnet 18, William Shakespeare Shall I compare thee to a summer's day? Thou art more lovely and more temperate Rough winds do shake the darling buds of May And summer's lease hath all too short a date Sometime too hot the eye of heaven shines And often is his gold complexion dimm'd And every fair from fair sometime declines By chance or nature's changing course untrimm'd But thy eternal summer shall not fade Nor lose possession of that fair thou owest Nor shall Death brag thou wander'st in his shade When in eternal lines to time thou growest So long as men can breathe or eyes can see So long lives this and this gives life to thee. 8 Iamb? 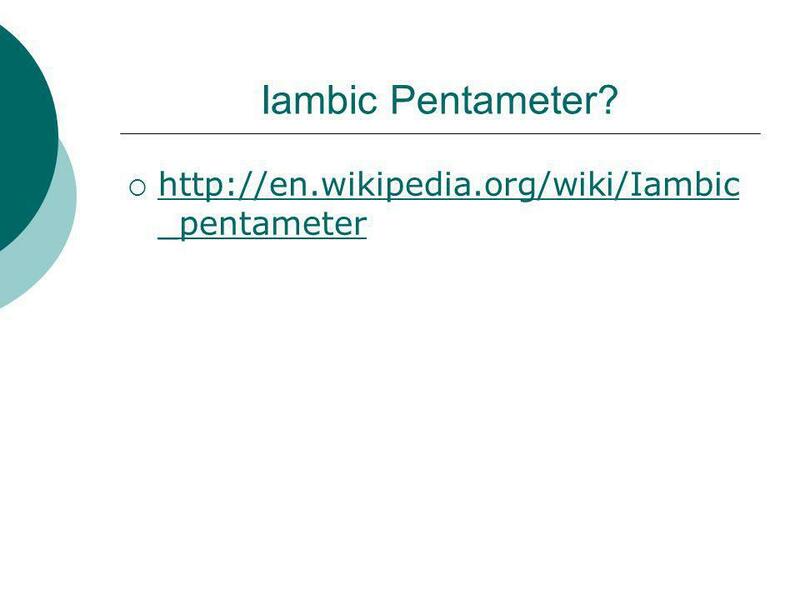 An iamb, or iambic foot, consists of one unstressed syllable followed by a stressed syllable.) Sonnet 18, William Shakespeare Shall I compare thee to a summer's day? Thou art more lovely and more temperate Rough winds do shake the darling buds of May And summer's lease hath all too short a date Sometime too hot the eye of heaven shines And often is his gold complexion dimm'd And every fair from fair sometime declines By chance or nature's changing course untrimm'd But thy eternal summer shall not fade Nor lose possession of that fair thou owest Nor shall Death brag thou wander'st in his shade When in eternal lines to time thou growest So long as men can breathe or eyes can see So long lives this and this gives life to thee. 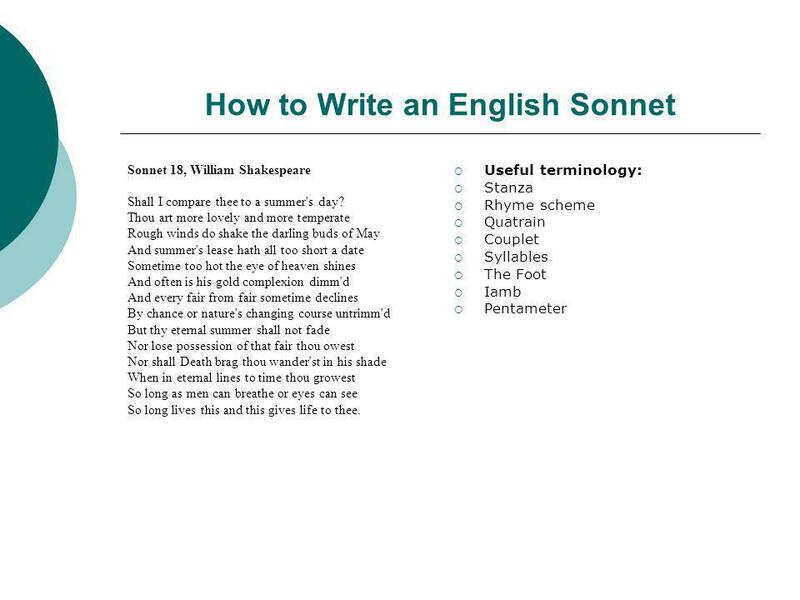 Download ppt "How to Write an English Sonnet"
An analysis of Sonnet 18 Valentina Henriet. + S O N N E T S Shakespeare First things first…if it’s square it’s a sonnet! 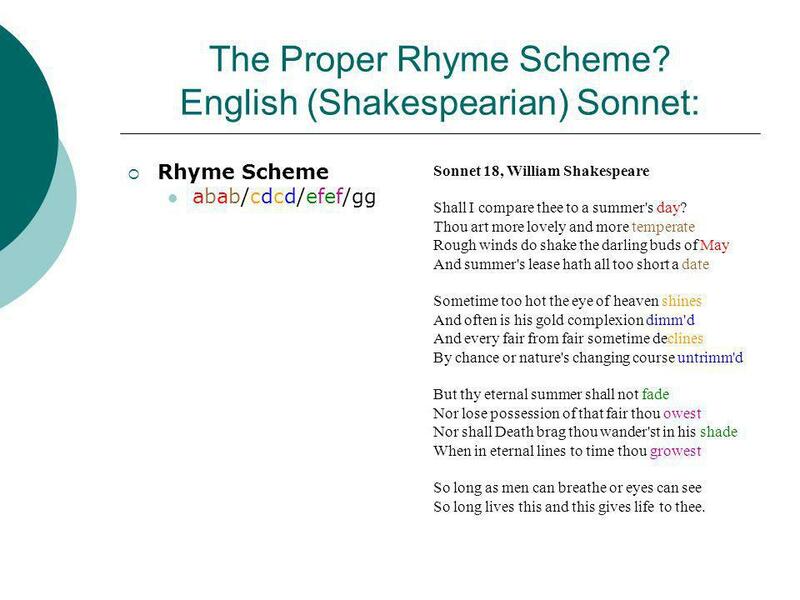 Sonnets: Are square…super recognizable form Have 14 lines Have strict. The Sonnet. 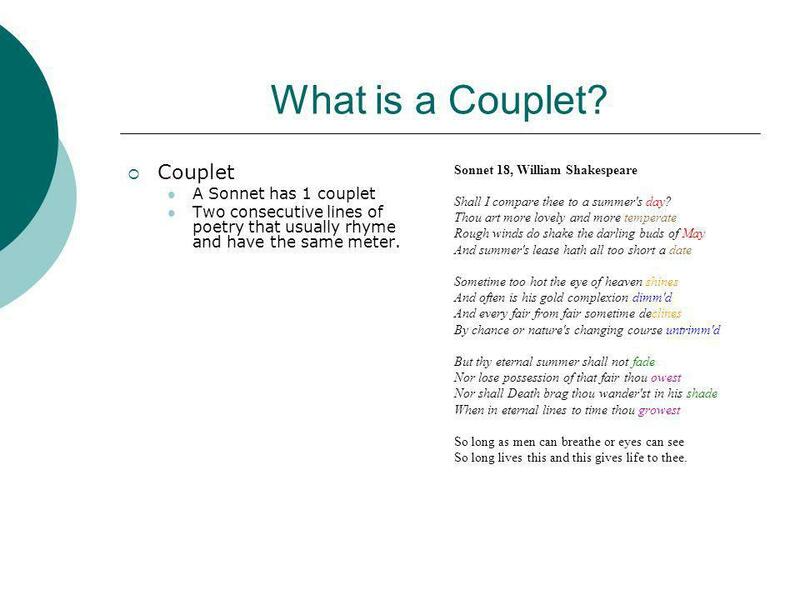 Basic Facts Shakespearean sonnet 3 stanzas 4 lines per stanza Each stanza is related to the previous stanza A couplet at the end: A couplet.  Although unknown, Shakespeare’s accepted birthday is April 26,  Lived in Stratford, which was a major port city in Englad.  Married Anne Hathaway. Putting it all together… POETIC FORM. Line Meaning  A single line in a poem Example 1Some say the world will end in fire, Some say in ice. From what.